KAPOLEI, Hawaii--(BUSINESS WIRE)--Dec. 13, 2017-- Sleep Number (NASDAQ: SNBR) recently celebrated the opening of its first retail store in Hawaii. Now, Sleep Number customers in all 50 states can shop in-store for Sleep Number’s proprietary and innovative solutions. 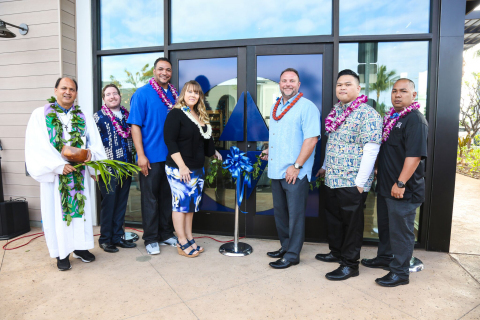 Before officially opening its doors, Sleep Number hosted a traditional Hawaiian blessing, which honors local culture and helps usher in goodness, success and growth to the store. The new 3,600 square-foot store opened Friday, Dec. 8, and employs four sleep experts and two home-delivery technicians. The company’s retail presence has evolved from a small mall kiosk in 1992 to a retailer with national distribution. Over the last 18 months, Sleep Number announced two other significant retail openings: in 2016, the Minnesota-based company opened its 500th retail location in Eden Prairie, Minn., and its first store in Alaska. Today, there are more than 550 company-owned Sleep Number stores across the county. Sleep Number® stores redefine the mattress shopping experience, leveraging the knowledge and experience of its sleep professionals and award-winning store design. In addition to featuring a complete line of Sleep Number® beds and exclusive bedding, the stores highlight SleepIQ® technology, a proprietary biometric sleep tracking technology that works directly with the bed’s dual-adjustability technology to track both sleepers at night. Thirty years ago, Sleep Number transformed the mattress industry with the idea that ‘one size does not fit all’ when it comes to sleep. As the pioneer in biometric sleep tracking and adjustability, Sleep Number is proving the connection between quality sleep and health and well-being. Dedicated to individualizing sleep experiences, the company’s 4,000 team members are improving lives with innovative sleep solutions. To find better quality sleep, visit one of the 550 Sleep Number® stores located in 50 states or SleepNumber.com. For additional information, visit our newsroom and investor relations site.